Barefoot Becky and the Ivanhoe Dutchmen recorded "Live-in-Person" on this DVD! 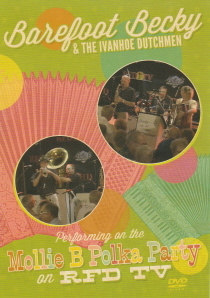 This DVD features Barefoot Becky and the Ivanhoe Dutchmen performing on the Mollie B Polka Party on RFD TV – 2011. This DVD is about 1 hour and 20 minutes in length. It was recorded Live-in-Person at the beautiful Starlite Ballroom in Wahoo, Nebraska. June, 2011.